Peter Thiel at TechCrunch Disrupt in San Francisco, 2011. Photo credit: Getty Images. When Inc. magazine’s Jeff Bercovici reported last August that billionaire Trump-supporter Peter Thiel had repeatedly expressed interest in the idea of harvesting the blood of young people to maintain his own youth, it left an indelible mark on Thiel’s public persona, as captured by headlines like “Peter Thiel Wants to Inject Himself with Young People’s Blood” and “Here’s Why Peter Thiel May Be Interested In Younger People’s Blood.” The television show Silicon Valley eventually featured a tech mogul who hires a young “transfusion associate” to provide him with fresh blood on-demand. Thiel’s ultra-libertarian politics and history of supporting vaguely nefarious projects—such as his successful plot to kill Gawker, his controversial application for New Zealand citizenship, and his recent suggestion that political corruption could be a good thing—have earned him the aura of a Silicon Valley fiend. His interest in Ambrosia, an obscure startup that injects older customers with blood drawn from youthful donors, was the perfect detail to round out his villainy. Although Buhr didn’t present her story as a major case of journalism fraud—she didn’t even contact Bercovici before publication—that’s exactly what Karmazin was alleging. If he was telling the truth, Bercovici was guilty of lying about one of the most consequential figures in Silicon Valley. The record indicates exactly the opposite, however. According to emails obtained by Gizmodo, and Bercovici’s accounts of conversations with Karmazin and Thiel’s own associates, the original story remains accurate: Karmazin did tell Bercovici that Camm contacted him to express interest in Ambrosia’s young-to-old blood transfusions. What’s not so clear is why Karmazin decided to change his story—or whether anyone in Thiel’s orbit has pressured him to do so. 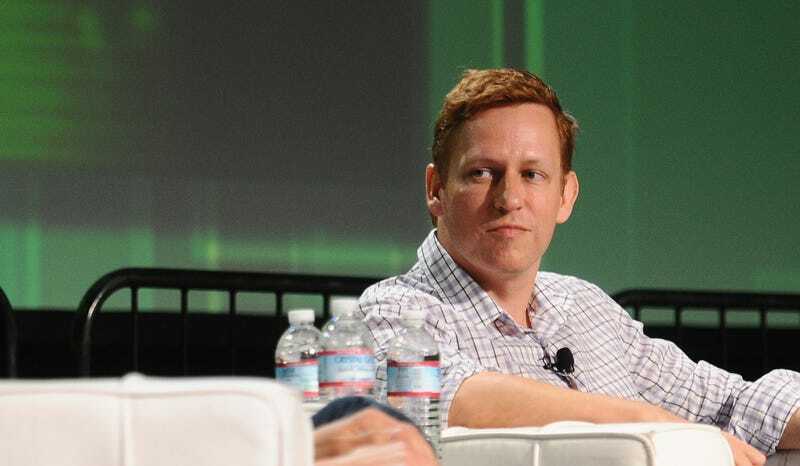 TechCrunch was not the first forum in which Karmazin began to distance himself from his earlier statement that Peter Thiel was interested in his company. He first denied the connection earlier this month at Recode’s Code Conference, where, according to CNBC, he “stressed that Thiel is not an Ambrosia customer.” On the same day, Gizmodo reporter Bryan Menegus asked Karmazin what kind of contact he’d had with Peter Thiel’s circle. Karmazin’s response: “None. I don’t know how that rumor started. So we haven’t had any contact with them. So I don’t know any information about that.” In an interview with Newsweek published a week later, he claimed to be unfamiliar with Thiel’s interest in parabiosis—despite the fact that Bercovici’s story had quoted Thiel talking knowledgeably about the process. TechCrunch’s report was the first to reflect Karmazin’s new claim that Bercovici had lied about their conversation last year. Hey Jeff, it was a pleasure to speak with you today. Please let me know if you have any questions or want to chat more, via email or phone. Below are some links for background for the young plasma field. Great speaking with you too. Thanks for all the material, looking forward to continuing the conversation. Hope you had a great weekend. Hey Jeff, I really shouldn’t comment specifically on individuals. That was an error on my part and ideally wouldn’t be included in a writeup. Sorry about that. But, I’m happy to answer any other questions you have. I did very much enjoy our chat. Are you planning on writing about this? Hey Jeff, just saw the article. It is very nicely written and I’m impressed with the amount of information you included. Thanks, Jesse! Glad to hear that. FWIW I didn’t see your previous note until last night. Since the story is primarily focused on Thiel it would’ve been difficult to remove the mention of Jason Camm but in any case it was too late for me to make more edits (especially as I’m officially on book leave, as of last Friday).Hope all the attention this story is getting is useful for your project. I would love to figure out a way to cover parabiosis in the book, potentially in a chapter about the crossover between life-extension medicine and sports medicine. If it would be possible to observe some of the work you’re doing in Monterrey, something like that might make a great chapter-opening scene. Let’s definitely stay in touch on it. Sounds good. Have a great time on book leave. Bercovici told Gizmodo that Karmazin volunteered Camm’s name after he inquired about investor interest in Ambrosia. Karmazin initially demurred, according to Bercovici, and explained that the company hadn’t done much outreach beyond advertising a clinical trial. There was one exception, Bercovici recalls Karmazin saying. Bercovici’s notes from the conversation, which Gizmodo has obtained, show that Karmazin told Bercovici “someone’s approached me sort of surprisingly early,” but they don’t mention Camm by name. Bercovici says that, during the interview, he immediately Googled Camm’s name and found his LinkedIn profile, which served to memorialize the mention of Camm’s name for the purposes of his reporting. I spoke with Jason Camm in August 2016, at the SENS Research Foundation’s Rejuvenation Biotech Conference. While our conversation was off the record, I can say at no point has Camm or anyone else from Thiel Capital denied to me that he called Karmazin. Taken together—the emails with Karmazin, Bercovici’s encounter with Camm, the lack of pushback from Hall—the evidence here clearly indicates that Bercovici’s story was right all along. Karmazin had multiple opportunities to correct Bercovici, both before and after publication. This story involves Peter Thiel, of course, so it’s natural to ask if something is going on beneath the surface. After all, why would Karmazin risk looking like a liar for the sake of denying that his startup drew the interest of a wealthy and powerful Silicon Valley investor? TechCrunch received a wave of criticism for Sarah Buhr’s article, and eventually added a correction regarding Bercovici’s characterization Camm’s contact with Karmazin, an apology to Bercovici for not contacting him before publication, and a lengthy response from Bercovici himself. TechCrunch’s editor-in-chief, Matthew Panzarino, said the site would “continue to do more reporting” on the story. Peter Thiel and Jason Camm did not respond to requests for comment. This story was produced by the Special Projects Desk of Gizmodo Media Group. If you have any insight into why Karmazin has changed his story, please get in touch.